Today’s episode is exceptional: It is neither about a figure nor about an event. We will be discussing a phenomenon that took place in the early 20th century or the late 19th century: The recording phenomenon. In the Middle-East, and more specifically in Egypt, recording started on cylinder records at an undetermined date. But the means and historical documents in our possession concern the invention that followed the record and was also called a record even though its shape was not that of a record: the 78LP disc. Those interested in the recordings made on 78LP discs within the scope of musical research include notably: first, American Prof. ‘Alī Jihād Rāsī of Lebanese origin, and second, French researcher Prof. Frédéric Lagrange who is with us today and will tell us about the History of recording, and essentially about the History of Record Companies. We have stated that this episode is about a phenomenon, not about an event or a figure. So, what will you tell us about the History of recording? Is there any other information besides the one I have on the History of cylinders? And what about the beginning of recordings on discs that were given the same name, i.e. “records”? Muṣṭafa Afandī, this issue must be looked at from three different angles. First: We must talk a little about the History of the arrival of record companies in the Middle-East, and the evolution of records manufacturing and of recorded music making in the Middle-East from the end of the 19th century until around 1932. We will also explain why this date is a transition between two eras. We must also discuss another angle: how records, or discs, had an impact on musical life in the Middle-East. Finally, we must also discuss how records affected music itself. Ibrāhīm al-Qabbānī, Yūsuf al-Manyalāwī, and others. But, were these recordings commercialized? They were certainly commercialized, but to whom? To an élite only: the number of music playing devices existing in the Middle-East at the end of the 19th century –I won’t say they can be counted on the fingers of one hand, but their number surely did not exceed more than one hundred or maybe two hundred devices at most. Only bourgeois and aristocrats owned such devices. The situation was such that even at the end of the 19th century… Well, Prof. ‘Alī Jihād Rāsī told once that he had found an Egyptian newspaper clipping dating back to the late 19th century, and that the author of the article could hardly believe how a machine was able to utter Arabic words, unpronounceable by non-Arabs in general. He could not believe a foreign-made machine could speak, and moreover, sing in Arabic! 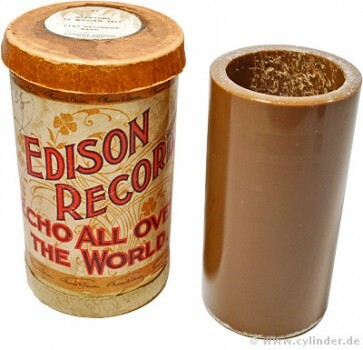 But in fact, after that, many rare recordings were made on cylinders. Maybe you could play for us a short excerpt of “Kādnī el-hawā” performed by ‘Abduh al-Hāmūlī? Let us listen to Sī ‘Abduh. So, let us move a few years later, after Sī ‘Abduh died in 1901. After that, the situation changed relatively. When did this happen? Precisely in 1903. The year 1903 is the equivalent of an earthquake in the History of music in the Middle-East. Famous tenor Caruso “is the one who manufactured the record” in the West. Caruso was the most famous singer in the West, the famous Italian singer or Italian tenor. His records drew the audience that was eager to listen to this great voice to buy this new disc-playing device, the gramophone (or phonograph), invented by Berliner. The reputation of Caruso expanded from East to West, and start-up record companies in America, England, Germany and France decided to conquer or to invade the world, whichever word you prefer. The invasion, or the conquest, of the Middle-East started in 1903. When were Caruso’s records made? In 1900 and in 1901. Two years after Caruso’s recordings, Gramophone and Zonophone –Zonophone was in a way the Italian branch of British Gramophone– launched their operation. Their first campaign in Egypt took place in 1903 where the first rank muṭrib apparently resisted against this invention… Not for religious reasons, they just wanted debutant muṭrib to try this new medium, then verify the result in order to decide whether to do the same or not. So, the 1903 recording campaign did not include any of the great performers like Sheikh Yūsuf al-Manyalāwī and ‘Abd al-Ḥayy Ḥilmī. Actually, the only one who was a little renowned at the time and participated in this campaign is Sayyid al-Ṣaftī. Actually, his reputation was just starting to rise. Exactly. His star had started to rise but to a certain limit. The names marked in history, those of this first group of muṭrib who tried this new medium are completely –or quasi– unknown and include some funny names such as Maḥmūd al-Teleghrāfjī, Naffūsa al-Bimbashiyya, and Naẓīra al-Faransawiyya. This campaign included two types of recordings: either ‘ālima singing light songs, called ṭaqṭūqa around the end of the 19th century, as wedding songs; or ‘ālima singing higher standard works such as dawr and qaṣīda, while the second and third ranks of male muṭrib also sang dawr and qaṣīda. There may be a recording of the Kuran, but I am not sure. I think the Kuran was first recorded in 1904 or 1905, and not during the 1903 first recording campaign. That was because they were awaiting a fatwa from the Azhar allowing the recording of the Kuran, and stating when one was allowed to listen to a recording of the Kuran instead of listening to it live. There is a strange occurrence in the 1903 first recording campaign: a name more famous as a composer’s name than a muṭrib’s and whose recordings –as a muṭrib– are included in this campaign: Ibrāhīm al-Qabbānī. Ibrāhīm al-Qabbānī is indeed among the great composers as well as the equal of Dāwūd Ḥusnī. He was not the competitor of ‘Abduh al-Hāmūlī or Muḥammad ‘Uthmān, but is ranked directly after them. Ibrāhīm al-Qabbānī’s voice probably changed, and I think we are lucky he recorded in 1903 before his voice changed and he was not able to perform well anymore. 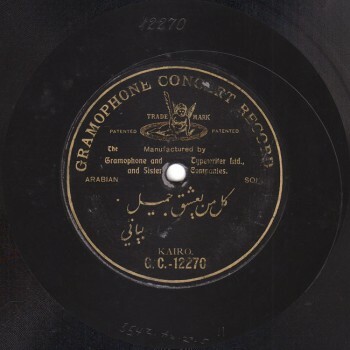 Recording campaigns followed one another starting 1903, starting with British record company Gramophone – Zonophone that conducted one in Alexandria and in Cairo in 1904, then in Bilād al-Shām starting 1905. British Gramophone was followed by German record companies. Odeon entered Egypt around 1904, 5, 6. The problem with Odeon is that, unlike Gramophone, we were unable until today to date Odeon’s recordings. While Gramophone records carry a matrix number that allows researchers to determine, maybe not the day, but at least the month of the recording, “January 1911” for example. As for Odeon, assessing the date of the recording is approximate to a certain extent since the only information we can rely on is for example the date a certain performer died..etc. The beginning could be in 1904 or 1905, God only knows. We are unable, to date, to reach a definite result concerning the Odeon recordings and Baidaphon’s early recordings. Baidaphon’s case is exceptional, one of two exceptional cases in the Middle-East: Baidaphon and Meshian. Most record companies were international and European. One may wonder why no American record company entered the Middle-East! The reason is very simple: British Gramophone is the same American record company Victor. Even today, records of Sheikh Yūsuf al-Manyalāwī or of ‘Abd al-Ḥayy Ḥilmī can be found carrying the label “Victor”. Victor records are the same British Gramophone records that were sold to Arab immigrants in America carrying the label “Victor”. It seems that British “His Master’s Voice”/”Gramophone”/”Zonophone” were responsible for foreign recordings, particularly in the Middle-East. Another British record company only entered the Orient in the 1920’s: Columbia. Let us go back to Baidaphon and Meshian. So, unlike these international companies, Baidaphon is a Lebanese company, an Arab company owned by the Baiḍā family, a known Lebanese family. It was founded in Beirut by Buṭrus (Peter) and Jibrīl (Gabriel) Baiḍā. Until today, we can find old records carrying the label “Abnā’ ‘amm Baiḍā, Beirut – Syria” (“The Baiḍā cousins, Beirut – Syria”). Even the announcement says “Baiḍā records, Abnā’ ‘amm Baiḍā, Beirut” before presenting the piece. 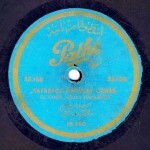 Baiḍā records became THE Arab record company. They even played on nationalistic sentiments, being an Arab company, not a foreign one. They called it “the gazelle brand” v/s His Master’s Voice’s dog, the Arab company of the gazelle v/s the foreign company of the dog. Second: Baidaphon was the national record company. They opened branches in two cities that were important to Baidaphon. The first one was where their records were manufactured, i.e. Berlin in Germany. So, the first non-Lebanese branch of Baidaphon was opened in Berlin, simultaneously with a branch in the Middle-East’s most important city in the beginning of the 20th century: Cairo. So, they started in Beirut, then Berlin and Cairo, followed by other branches almost all over Egypt. As for recording purposes, branches were opened in Damascus, Baghdad, Tunisia, and Marrakesh in the Maghreb. 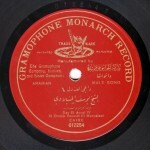 Baidaphon was indeed the Arab record company that recorded all the Arab singers. And even though it started off with Farjallāh Baiḍā’s beautiful voice that you must play for us a little. (His name was pronounced “Firjallāh” in these old recordings). Shall we listen to him? So, Baidaphon started off with Farjallāh Baiḍā, then it moved very quickly to Egypt. I think that most of its sales did not come from Levantine muṭrib, but from the great Egyptian ones. Also, Baidaphon succeeded in attracting the great song masters and geniuses such as ‘Abd al-Ḥayy Ḥilmī, Sayyid al-Ṣaftī, and many others. We will end today’s episode with Baidaphon’s journey, and we will resume discussing record companies in the Arab World in the coming one.